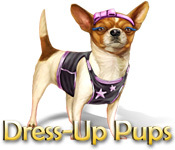 Dress-up Pups is rated 4.5 out of 5 by 13. Rated 5 out of 5 by mcgaelicgal from CuteCuteCUTE! This is my new happy place! Great "end of day stress reliever". Found myself smiling all the way through the levels I've played so far. Cute story line. Beautiful dog images. Nice mix of swap, chain and blast-action moves; fairly easy so far, but not boring. Puzzle is a fun little bonus. Since I always have my own music playing, I appreciate being able to turn the soundtrack off, but leave the game sounds on. A few levels in, and I can already tell I'll be playing this OFTEN! Rated 5 out of 5 by lloydse from Neat and Sweet This is a lovely, straightforward, appealing M3 game suited to adults fond of the genre and to kids/families. Dogs feature and numerous endearing "painted" portraits serve as backgrounds. 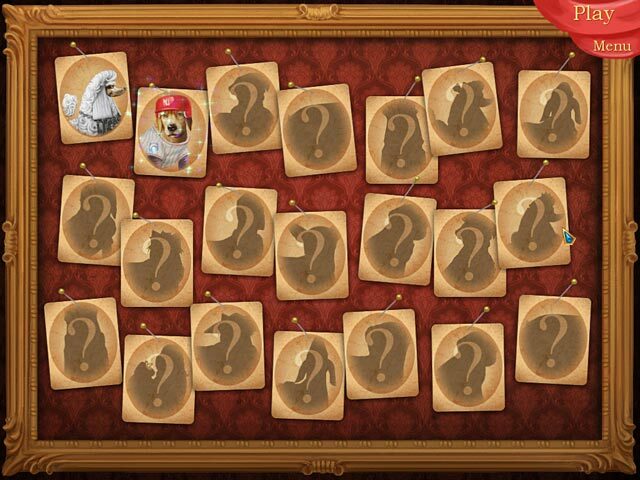 The games themselves are standard, work very smoothly, have cute icons suited to the canine theme. The jigsaw puzzles are a pleasant interlude between levels. If you are a parent introducing a youngster to M3, note that the "group" mode of play goes smashing fast and would delight any child who finds the traditional "swap" and "chain" modes a bit tedious to master. Lovely game overall. I'm not big on story lines so I skip through those pretty much ... they are fine, just not the part of the fun I'm after. Buy it, you'll be happy and may just find yourself at the local shelter adopting a pooch to share your family's home. Rated 5 out of 5 by myyorkies1994 from For Everyone's Whose Dog is Their Kid! While this game is colorful, not difficult, has crisp graphics and soothing music, it's just plain fun for anyone whose dog is/was more than just a dog. The renditions of puppies before each game are beautiful and, no doubt, you'll see you're dog there. There are varying game board layouts, plentiful explosives and varieties of M3 (swap, chain, group) so it's always something different. For every dog lover! 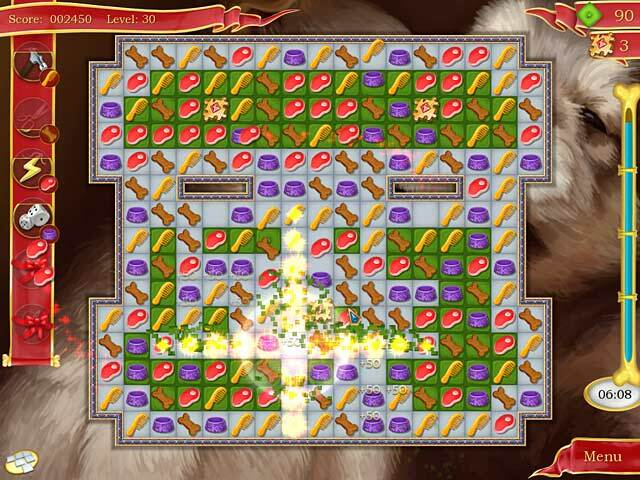 Rated 5 out of 5 by sparklefish777 from Sweet Puzzle Game This is a great match 3 game, especially if you like dogs. Basically, you must release puzzle pieces and blocked squares. 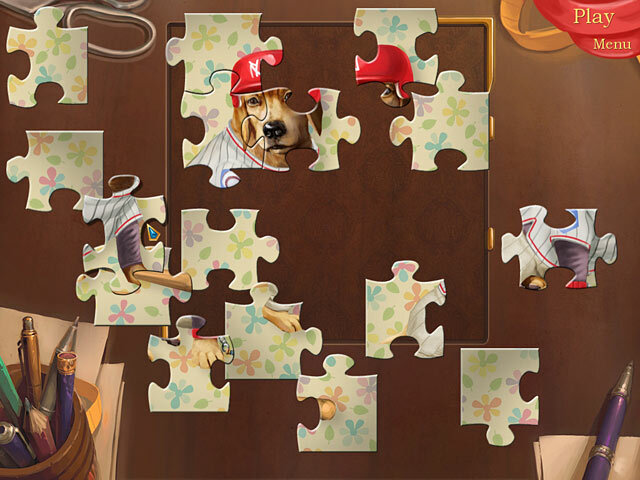 After completing each level, you can use the puzzle pieces to create a dog themed puzzle. Once the puzzle is complete, you will have created a new outfit for your doggie customer. Levels switch from match 3 mode to chain mode and group mode. And you match the most adorable objects such as hearts, dog bowls, dog houses, treats, etc. Very fun and relaxing game! Rated 5 out of 5 by fair_cher from My go-to happy game This is one of very few games I keep on my computer permanently; it makes me smile when I play. This game is for dog-loving adults. The outfits are sophisticated and varied; sports, evening wear, etc.There are six power-ups and you receive bombs and dynamite to blow up tiles when you make larger matches. You work puzzle pieces off the gameboard and get rid of colored tiles. Then you make a jigsaw puzzle with the pieces. There is swap, chain, and group mode. Only a gentle touch is needed to get pieces to move; so no carpal tunnel. The music is fun and upbeat, but pretty. I enjoy reading the dialogue to see what each client is asking for. Overall, the pups are adorable and I love this game. Rated 5 out of 5 by kasiabron from Love this game! Another dress up up please!!!! Rated 5 out of 5 by CathyLovesBFG from Excellent Game I Loved this Game it is so much fun, it has adorable dogs on it and i scored big, please made Dress-up Pups 2. Rated 5 out of 5 by ash2008 from the best the best game in the world!!! !